Guests step through a gothic archway as they begin their journey toward the Dragon Challenge attraction. 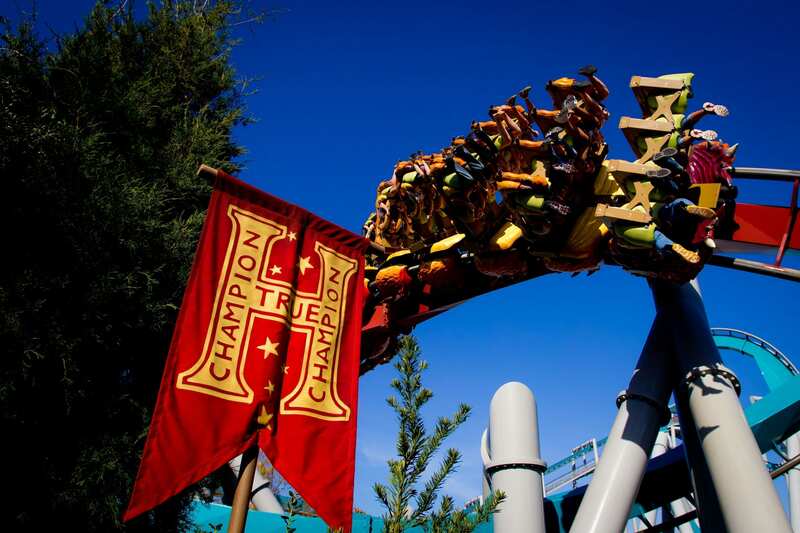 The queue, flanked by Triwizard Tournament flags and banners, fills with triumphant music as guests come through the champions tent and get a glimpse of the iconic Goblet of Fire and Triwizard Cup. Guests then proceed through dark corridors, tunnels and caves. Guests may even hear dragons in the distance in advance of the upcoming task. Get ready for lights, camera and real time action at Universal Studios Florida and Universal’s Islands of Adventure. Movie magic wisps guests into their favorite stage sets through thrilling attractions and rides. It is a great choice for thrill seekers with plenty of coaster action from the Dragon Challenge dueling coasters to the Hollywood Rip Ride Rockit. Guests will be spellbound by realistic depictions of J.K. Rowling’s classic at King’s Cross Station and Diagon Alley. At the end of Diagon Alley, a 60-foot, fire-breathing dragon is perched on top of Gringotts bank – which houses the next generation, 3-D thrill ride, Harry Potter and the Escape from Gringotts. Brave the journey with Harry, Ron and Hermione as we broke into Gringotts bank, escaping with the help of the dragon. Cool off at Weasleys’ Wizard Wheezes with a pistachio vanilla swirl ice cream at Florean Fortescue’s Ice-Cream Parlour. From Diagon Alley, board the Hogwarts Express to the Wizarding World of Harry Potter and traveled through the British countryside. Shadows of favorite characters linge outside compartment door as Hagrid flies outside the window. Beware of Dementors lurking about. The Wizarding World of Harry Potter offers breathtaking views of Hogwarts castle. Within the castle is the Harry Potter and the Forbidden Journey attraction with spectacular technological imagery, allowing muggles to soar through Hogwarts. A must have is Butterbeer. The creamy concoction tastes like butterscotch rootbeer, if there were such a thing. Shop at Ollivanders for an interactive wand which will make magic happen at select sites in Hogsmeade. It is surreal to shop at Filch’s Emporium of Confiscated Goods, perusing through Hogwarts school robes at Dervish and Banges and then dine at the Three Broomsticks. Additional attractions, which the entire family will enjoy, include Despicable Me Minion Mayhem offering animation and the latest 3-D technology to create a heart-warming, wildly hysterical theme park experience. Universal houses attractions from additional movie favs as Jurassic Park, Men In Black, Terminator and more. The entire family will enjoy sites, rides, attractions and more. Brand new to the park is Skull Island, taking guests through the forbidden lands of King Kong. Stay tuned. Visit www.universalorlando.com. The place to stay is Magic Village. The furnished luxurious villas offer 3 and 4 bedroom suites, a kitchen with some offering a summer kitchen with barbecue. Each unit can accommodate up to six people. It is the perfect place to relax and unwind after a full day of action and feels like home. There is a pool and workout facility onsite as well. Visit www.magicvillagevacationhomes.com for more information. Check out the Capone’s Dinner & Show, a lively comedy and Italian buffet. All ages will enjoy this night out as Chicago gangsta’s come to life on stage, engaging with the audience. Visit www.alcapones.com.